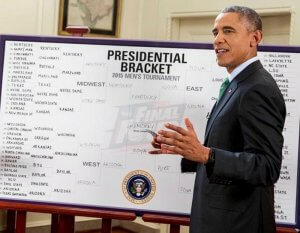 DemDaily: March Madness and Obama’s Picks! It is here! 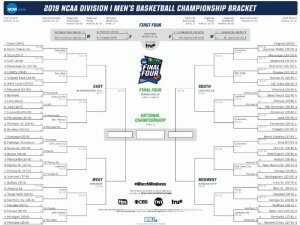 One of country's most exciting annual sporting events kicked off last night and, in the interest of keeping DemList followers informed, we are explaining March Madness. March Madness is the colloquial term for the annual National College Athletic Association (NCAA) Division I men's basketball tournament. It is a single-elimination tournament of 68 teams that compete in seven rounds for the national championship. The penultimate round is known as the Final Four, when only four teams are left. 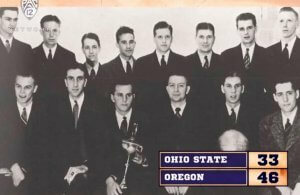 "March Madness" was first used to refer to basketball in 1939 by Illinois high school official Henry Porter. It wasn't, however, until CBS broadcaster Brent Musburger used the term during the 1982 NCAA tournament, that it became synonymous with the championships. 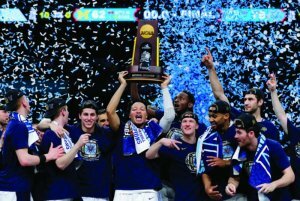 A team can get there two ways: 32 Division I conferences all receive an automatic bid, which they each award to the team that wins the postseason conference tournament, known as automatic qualifiers. The second avenue for an invitation is an at-large bid. After all regular season and conference tournament games are played, a 10-member Selection Committee decides which 36 teams, other than the automatic qualifiers, have the pedigree to earn an invitation to the tournament. There are a multitude of stats and rankings that the Selection Committee takes into account, but there is no set formula for determining an at-large bid. Once the field of 68 is finalized, each team is assigned a seedbased on regular season and conference tournament performance, and placed in one of four regions, which determines their first round matchups and path to the championship. On March 17th, "Selection Sunday," the Committee reveals the full NCAA tournament bracket. Four of those teams are eliminated in the opening round of the tournament (known as the First Four), leaving a field of 64 for the first round. former President Barack Obama is a known basketball fan. Click for his 2019 picks! To reward the better teams, first-round matchups pit the top team in the region against the bottom team (No. 1 vs. No. 16). Then the next highest vs. next lowest and so on. When teams are narrowed to sixteen, it is called the "Sweet Sixteen." The 2019 regional game sites are Hartford, Connecticut; Salt Lake City, Utah; Des Moines, Iowa; Jacksonville, Florida; Tulsa, Oklahoma; Columbus, Ohio; Columbia, South Carolina and San Jose, California. The Final Four will be held in Minneapolis, Minnesota on April 6th and 8th, and the championship game on April 9th. DemList is a daily political column, resource and network dedicated to informing, educating and connecting the Democratic family to the players, politics and issues. SignUp!